A true innovation in personal protection. Have bear spray ready and accessible at the critical moment you need it! A must have for hikers, hunters, bikers and runners. Easily attaching to a belt, backpack or bike - the Bear Spray Holster from Rapid Rifle Covers will allow you to quickly defend yourself. Bear spray can be activated in the Holster itself, or by quickly pulling spray free from Holster. It is the only holster available that is truly ambidextrous - meaning it can be carried in any position (without the fear out it falling out of the Holster). The holster can be used with or without the safety bungee over the trigger. All holsters can be mounted in all directions including upside down for use on backpack straps. 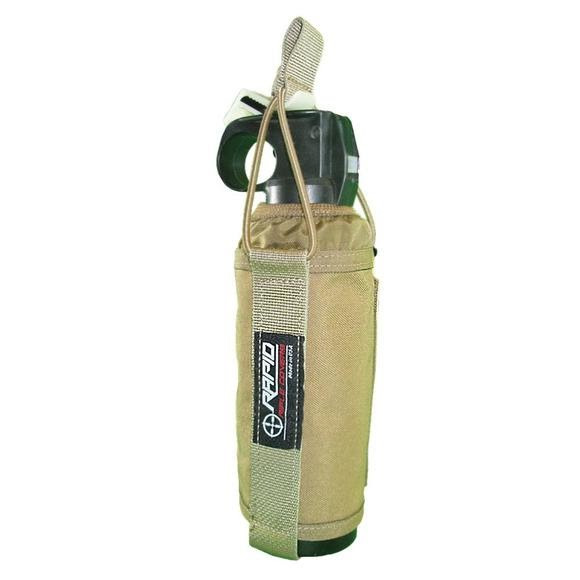 Rapid Rifle Covers&apos; Bear Spray Holsters fit tight around the neck of the spray but allow for instant removal. All Holsters can be mounted on up to 3" webbing and on all Molle webbing.